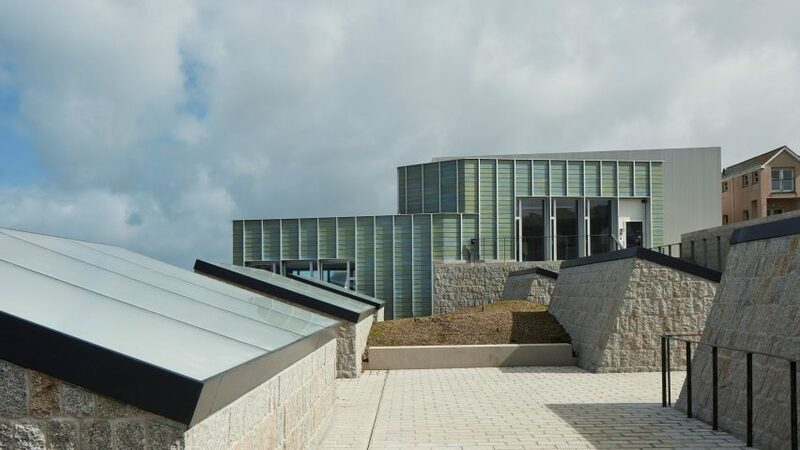 Jamie Fobert Architects has completed a cliffside extension to the Tate St Ives in Cornwall, southwest England, which includes an underground gallery, a rooftop garden and ceramic cladding that mirrors the hues of the sea. The London-based studio, lead by Jamie Fobert, designed the 1,325-square-metre extension for the existing Tate St Ives art gallery – a white rotunda completed in 1993 by London firm Evans and Shalev. Fobert excavated the site behind the existing building and submerged the bulk of the new structure below ground to make the most of the available space. It also ensures the extension does not block sea views from the residences also built on the cliff top at Porthmeor Beach. Granite outcrops and Cornish wildflowers cover the roof of the gallery to create a public garden that is intended to help the building blend in with the coastal landscape. A pathway leads from the roof to a car park at the top of the cliff and to the beach at the bottom, providing an alternative route to the existing steep ramp. "One of the things we wanted to do was allow the rooftop to have a much gentler route," said Fobert at a preview of the design earlier this year. The garden landscape is punctured by six huge stone-walled skylights that rise 3.5 metres on top of the gallery. The architect designed the "room-sized" lights, which measures three by five metres, to bring in plenty of natural light. Unusually, Fobert chose to angle the lights towards the south rather than the north as it provides a warmer light that he said is more suited for the gallery. The daylight is then filtered through 1.5 metre-deep ceiling beams before hitting the exhibition space. "We capture the southern light on a very weak angle but because they are three and a half metres deep, the light within them is always indirect," said Fobert. "There's an area on the floor which has quite a bit of light intensity but because none of that light intensity falls onto the walls there's this very limited, very controlled amount of daylight on the walls." Inside, the five-metre-high gallery is column free and completed with simple finishes to offer flexibility for a variety of exhibitions. Other adaptable features include black-out blinds to cover windows for light-sensitive displays and partitions, which can be used to separate the column-free space into six separate areas. Fobert's extension also includes a four-storey building that abuts the underground gallery and includes workshops, a loading bay, staff offices and visitor facilities. Blue and green glazed ceramic tiles cover the walls to reference tones of the water. The project nearly doubles the size of gallery space on offer, allowing the Tate to host seasonal exhibitions alongside the permanent show of 20th-century British artists with ties to the local area, which will be hosted in the original gallery space. It will also enable the gallery to remain open all year round without the need to close during exhibition changes. "For the first time, Tate St Ives will be able to give a permanent presence to those iconic 20th century artists who lived and worked in the town, demonstrating the role of St Ives in the story of modern art," said a statement from the Tate. The Tate St Ives' original architects Evans and Shalev have also renovated the existing gallery spaces as part of the project. These galleries of the permanent exhibition are already open to the public, while the new gallery is set to open on 14 October 2017 with an exhibition of work by sculptor Rebecca Warren. Once open, the gallery is expected to attracted 250,000 visitors each year, almost triple the amount the building was originally able to accommodate. Tate St Ives was established after the Tate began managing the Barbara Hepworth Museum and Sculpture Garden in St Ives in 1980 and wanted to develop a permanent museum to exhibit the work of local artists. It is joined by Tate galleries across the UK, including the Tate Britain and Tate Modern in London, and the Tate Liverpool. Founded in 1996, Fobert's studio has previously completed a proposal for London's housing crisis, a townhouse with handmade bricks and bronze panelling and a residence featuring pale brick walls and a sunken concrete floor.